Run VueMinder Pro Site or VueMinder Ultimate Site for the first time. Use the About command on the Help menu. The About dialog shows the current version and the location of the site license file. 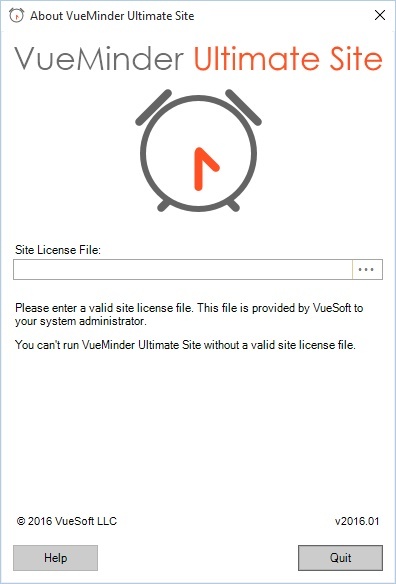 The first time VueMinder Pro Site or VueMinder Ultimate Site is started on a computer, you will be prompted to enter the path to a site license file. This file is provided by VueSoft to your organization after a site license is purchased. If you're not sure where the site license is located, contact your system administrator. To select a site license file, type in its path or click the "..." button to browse for it. The license must be located somewhere that VueMinder will be able to access the next time it starts, such as a shared folder on a network drive that is mounted at Windows startup. 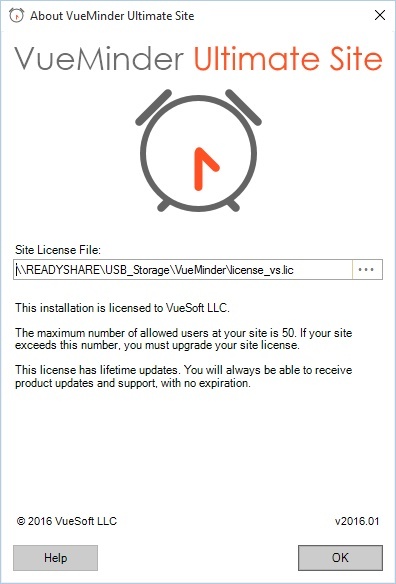 After selecting a valid site license file, the window will update to show your site license information and expiration date of the current service contract. The Quit button will be replaced with OK. Click OK to continue loading VueMinder. The site license information will show the organization name the software is licensed to, the maximum number of users, and the update protection expiration date. If your organization exceeds the maximum number of allowed users, please contact VueSoft to upgrade your site license to the next tier. Update protection allows free product updates, including new major releases. It also provides your organization with the highest priority level when contacting VueSoft's technical support team. After your organization's update protection expires, you can continue using your current version of VueMinder for as long as you'd like, but you will no longer be able to receive product updates. Technical support will still be provided, but at a lower priority. To renew your update protection, use the appropriate link below, based on which type of site license was purchased and the maximum number of users. After renewing, a new license file will be provided to replace the previous one with no impact to existing users. If you have questions that aren't answered here, you can reach our support team at support@vueminder.com. If you're using VueMinder Ultimate you'll have our top priority. Otherwise, we'll reply as soon as all VueMinder Ultimate requests have been completed (and always within 1 business day).